Labour laws in Switzerland are great: One day my boss told me that I have to take a paid 3-months vacation, otherwise he'd get into trouble because of my overtime. So, Sonam and I decided to spend the autumn of 2005 in the Himalayas. With only a loose itinerary we flew to Kathmandu, made it our home base, and visited different areas during the following weeks; first to Tibet, then Sikkim and then back to Nepal itself. We had a great time, faced no problems and came back very relaxed. During the flight from Kathmandu to the "Roof of the World", we pass Mount Everest and 4 other 8'000 meter peaks and arrive in Lhasa. Military presence, ignorant and obnoxious tourists (mainly from China, but from other countries, too) make it difficult to enjoy the Holy City these days. We feel better in the company of nomads in the country-side where we want to trek Namtso, the "Heavenly Lake". Bad weather and unwilling yaks force us to change our plans, but we do make it and stay at the great lake's shore for some days. With a jeep, we drive back overland to Nepal, and have enough time to enjoy the vast Tibetan landscape. A detour takes us to Rongbuk where we sleep in the monastery and enjoy a stunning sunset and sunrise on Mount Everest. There's probably few places on earth that have the diversity of Sikkim: the small Indian state rises from the hot and dusty Bengali plains barely above sea level to the summits of eternal snow. The changes in culture, landscape, vegetation and wild-life are immense. While Sonam stays with her family in Gangtok, I set out to discover the "Valley of Rice", by walking. In West Sikkim I sweat during hot and steep climbs through dense forests, am freezing during ascents to viewpoints for stunning sunrises, and try to get enough air on the way to high passes. I walk along green glacial lakes below hanging glaciers, hear avalanches thunder down the steep ice-clad flanks, and climb up on ridges of moraines. Then I stand at the top of the Goecha La pass and enjoy stunning views at the foot of the 3rd highest mountain on earth, Kangchenjunga. Nepal has more to offer than high mountains, so we spend some weeks in its southern part where it's still warm in December. We fly to Pokhara, and from the lake enjoy views of high mountains. We stay with water. At a brave moment we sign up for a kayak whitewater course, not really knowing what we get ourselves into. We pack our sleeping bags into the kayaks, put on a helmet and life-jacket and find ourselves on a Himalayan river for the next few days. We have two great guides, the water is warm and the rapids "only" grade 2 and 3. But it does take courage, especially when the kayak flips and suddenly you find yourself upside down under water, feel the current and try to wriggle yourself out of the narrow boat. We spend Christmas in a local house, sleep on a wooden plank and share the room with goats and chicken. We count this as one of the highlites of our trip. 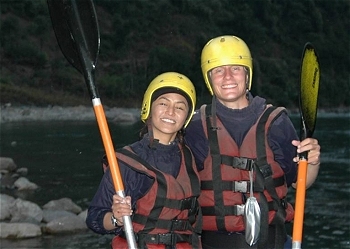 And Sonam is the first local woman ever to kayak Nepal's whitewater. On a local bus we drive further south to the Chitwan National Park. Switching mode of transport, we're on elephant's back for the next days and roam the jungle looking for monkeys, rhinos, and tigers. Tigers remain elusive, large footprints are all we get to see. Maybe that's good, because one of the tiger's has just eaten an elephant driver's wife.